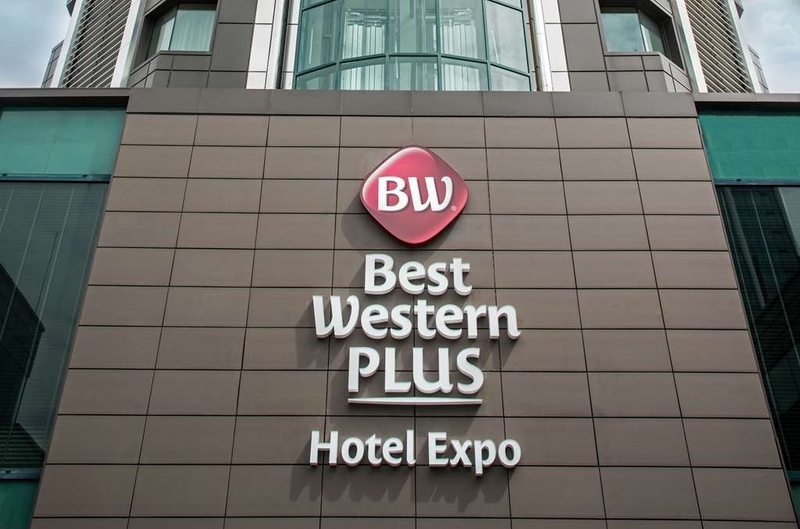 The Best Western Plus Expo Hotel is ideally located in the center of Sofia. Come and experience our hotel near the major tourist attractions. Best price guaranteed and exclusive deals. 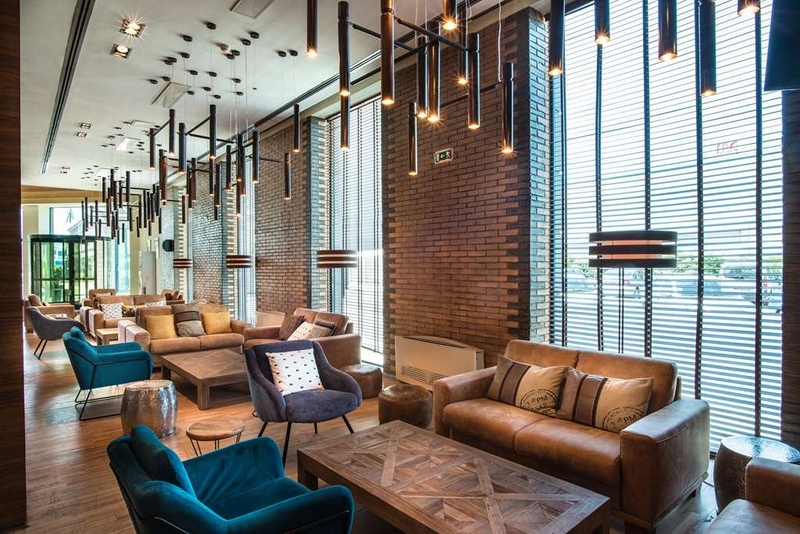 "A true sample of high level hospitality"
Without a doubt this is one of my favourite business hotels in Sofia. I have stayed there several times and each visit is acompanied with an excellent service level. 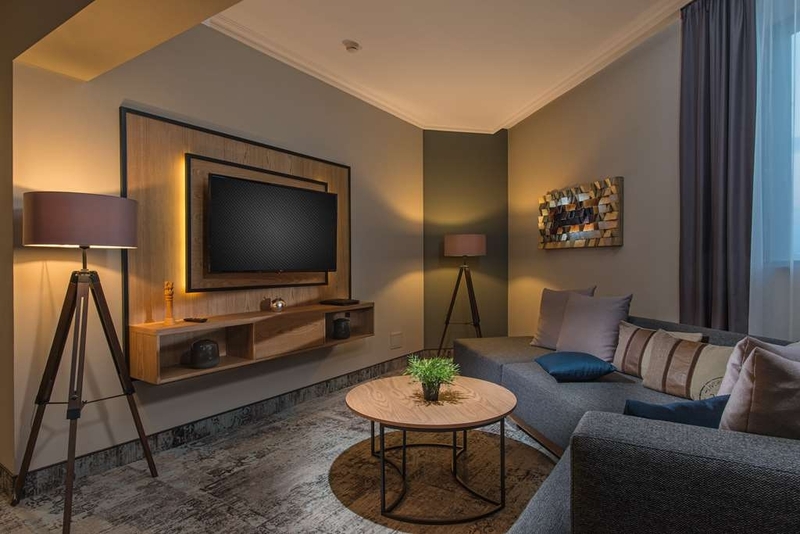 I always receive a fast and adequete service at the reception, the rooms (stayed in different types of rooms) are elegantly decorated with a good and comfy design. 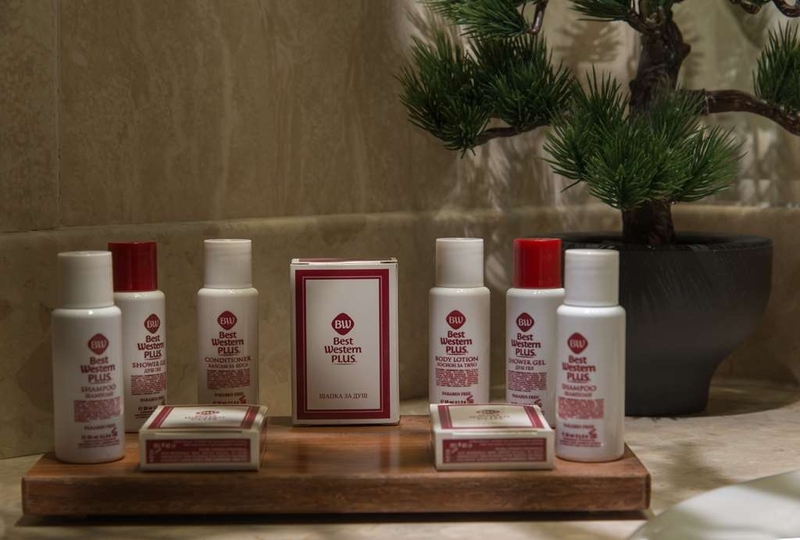 A business traveller gets all the amenities he might need. 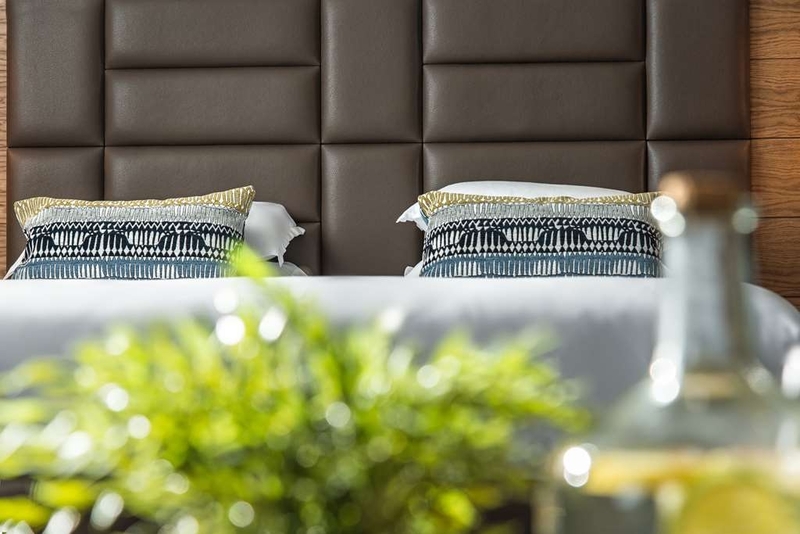 Very important are the comfortable beds and the quiet and calm atmosphere in the hotel. The restaurant offers high quality breakfast with good variety as well as tasty options for lunch and dinner. 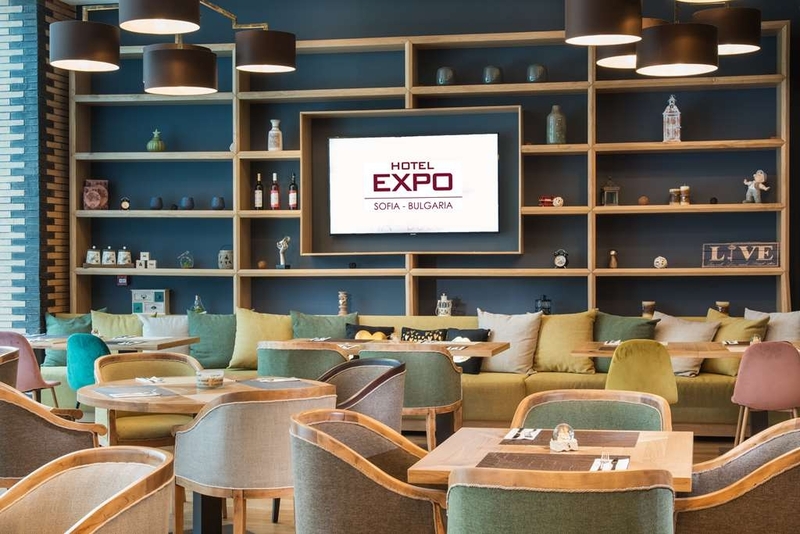 The hotel is located right next to the Sofia Inter Expo Center, offers good parking conditions as well as easy options to get to the airport or to the Sofia center (metro station is 2 min walk from the hotel). The property is very clean. The staff is well trained to look after all your needs. All respect for the general manager who does a great job. I would recommend the hotel without any hesitation. "One of the worst hotels I stayed at"
Big, big mistake I made by canceling my Hilton reservation and move here. I should not listen to my customer and switch to this dump. The hotel is dated, room were smelly, bathroom sink does not drain, toilet does not flush well The breakfast was nasty, horrible and disgusting. Cold scrambled eggs, cold sausage... the coffee machine never worked. On top of all this they have rude and very none professional ppl working at the restaurant. When I complained about the coffee and the cold egg, the guy told this is what we have if you do not like it go somewhere else. I was shocked and pissed by this as I never seen so rude servers in my 25 years of traveling. Even in China where they are known for being rude I never experienced this. I will next time either go to the Novotel or Hilton downtown and coup with traffic. I will 1000% not recommend this hotel to any business traveling person. I had to say the only good thing is they ordered and paid for our airport taxi as their shuttle was in the shop. 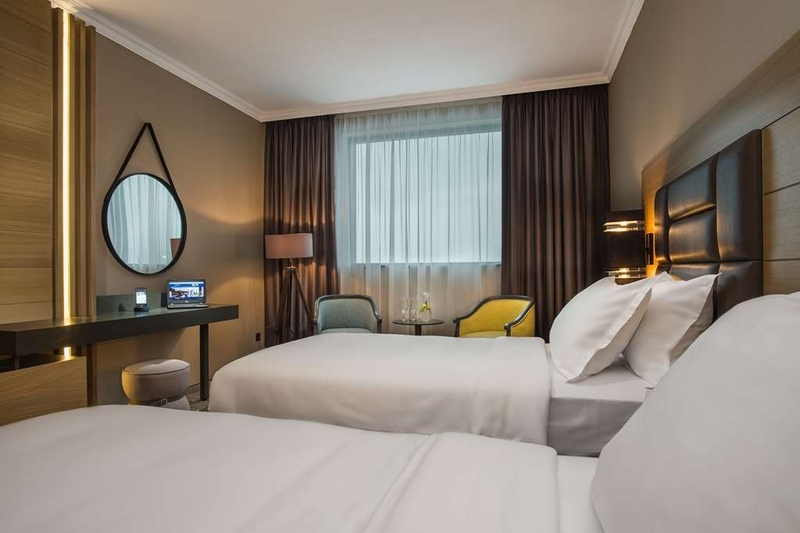 This hotel is in the center of city, great value for the money,metro is 3 min walk and close to several restaurants and bars. Will stay here again. Some employees don't speak English and hard to communicate. "Vary bad , very poor for what you pay . lack of cleaning , mold and dust everywhere"
The hotel wasn't so good as expected, the room was too cold and there wasn't any heat source. The manager wasn't able to fix the problem and we freeze inside our well-paid room. We book the corner room with the view but the windows were so dirty to enjoy it. Everything inside the mini bar was molded wtf, the power sockets hade a layer of dust on them, the carpet became brown from the dirt, it was disgusting to walk on it barefoot. the breakfast had a large variety of items but we didn't enjoy it because it was all cold. As a total experience, it doesn't worth the money they ask for.The Hotel position it's not very convenient if you haven't got a car. Great location and service! Close to Mall, Metro station, the Expostation, free shuttle to the airport! Good, clean and tidy rooms! The restaurant offers great food! All the stuff is really helpful! And the best part- free parking area! Definitely great place to stay! "Great hotel for the exibithions"
Very nice hotel and very friendly staff. Breakfast is good. Maybe only a little short on tables. Transfer to and from the airport is arranged easy and on time. Spacious room and bathroom. I don't like to take a shower in the bathtub so a simple walk in shower would have been good enough for me. Bed is very good and huge! "Great stay, amazing hotel! " I was traveling for business and my two day stay was amazing, I'm very pleased with the hotel and the kind staff! Expo hotel is right next to the metro station, so it was very easy to go to the airport and to the city center. The Front desk was very kind to arrange for me a taxi when needed. The room itself seemed very recently refurbished and was really comfortable. Must also say that the breakfast was fresh and in good variety. Would stay here again on my next visit. 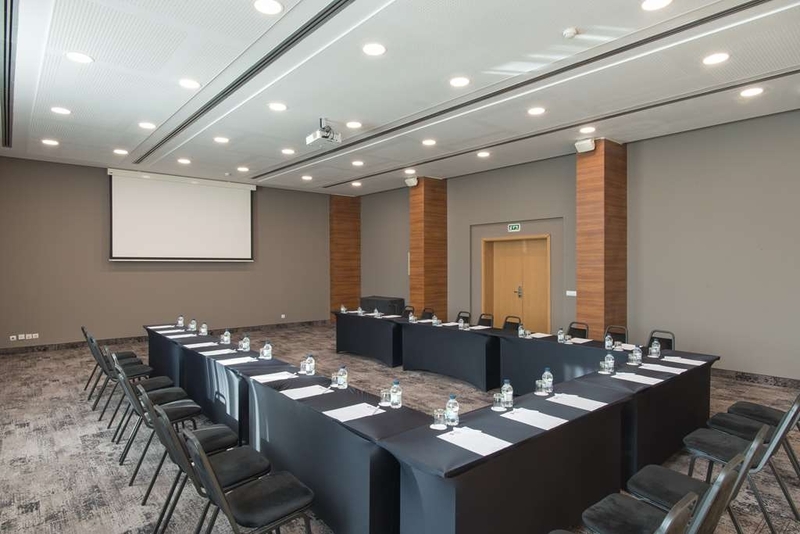 "Very good for Business trips & Expo"
Just a great location near metro station and Inter Expo center Sofia. Very attentive staff, excellent facilities. Breakfast was delicious and fresh, the staff was polite and friendly. The room was nice, comfortable and the most important - clean. The only problem was with parking place for my car. I needed to keep my car near the street for almost 2-3 hours as the parking place was full with cars probably from people who attend Expo Center or conferences in the hotel. My stay was simply perfect. The hotel is just excellent. 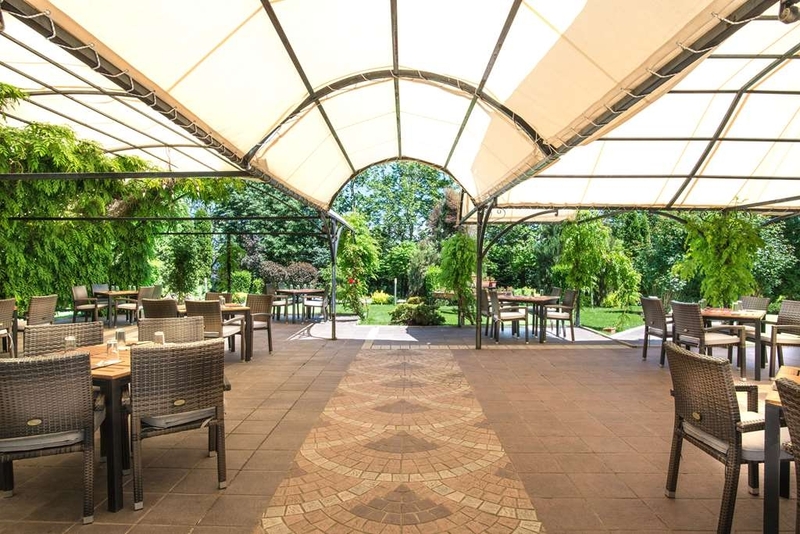 Good location near the airport and a subway station. Big spacious and clean rooms. Friendly and professional staff at the reception desk and the restaurant. Rich breakfast. Definitely will stay again. 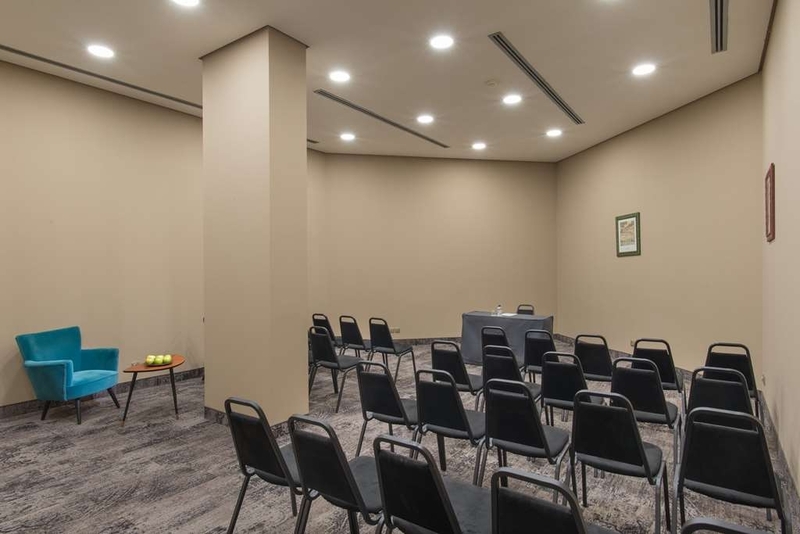 "Stay at the Best Western Plus Hotel Expo Sofia"
Everything, excellent hotel, in great location near metro station and Inter Expo center Sofia. Very attentive staff, excellent facilities and wonderful breakfast. I love to stay here every time when I travel to Sofia. Thank you! Good Points: Staff very helpful, professional and polite. breakfast very good with lots of choice, restaurant is not bad and cheap. Room was large. Free shuttle bus to airport, next to metro stop to get to town, opposite a supermarket and near a big mall. Bad Points: Building was built in 2014 circa. Stairs look like they haven't been cleaned since. Gym in basement is ancient with worn out equipment. Rooms are a bit old (but looks like they are gradually being updated). But worst point is the cleaners of the room every day, sometimes no new toilet paper provided, sometimes no new towels, sometimes no new bathmat. Shampoo and soap hardly ever changed. Complimentary tea and coffee not replaced, free mineral water rarely replaced. The glasses and cups aren't washed, they simply rinse them out every day and put them back. They didn't change them in two weeks so I took some from breakfast to have clean ones. When I got to the room there was no curtain on one window, staff were helpful and two days later one was fitted but it was wrong size so light always came in. Room rarely vacuum cleaned, and some surfaces very dirty with dust. Bathroom tap was breaking and mould underneath it. Stains in carpet in room corridor. Also often on Friday and Saturday hotel does weddings which are loud until around midnight. You can't open the windows and the corridor doesn't smell so fresh. Overall it's fine, but cleaning standards need to be raised dramatically. Helpful front desk and staff. We had paid for a regular room and received complimentary upgrade to king bed, two bathrooms (a tub!). Very nice room, and comfortable. They have complimentary shuttle to airport but since we left at 4am, it was a cost of 9,50 euros. 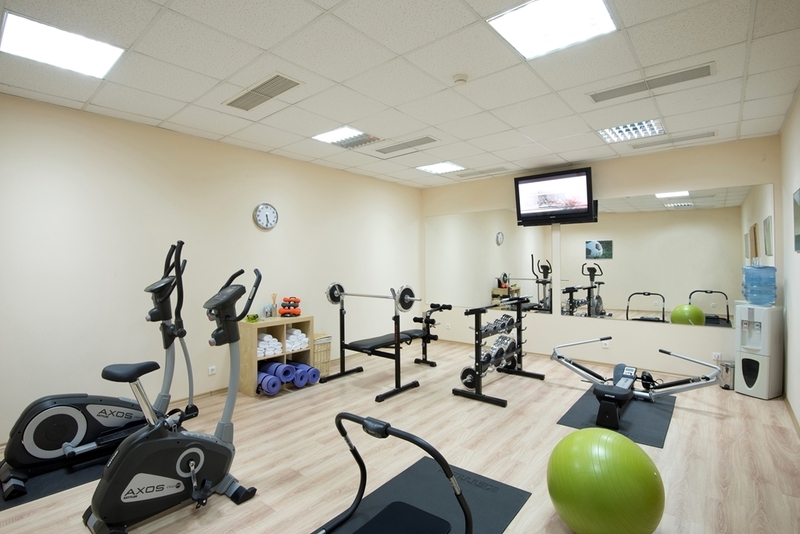 Has fitness room (very small with limited equipment) and sauna but we did not have time to use it. Would stay here again. A wonderful hotel! The room was spacious, clean and well funished. The view was beautiful! The staff was always smiling and ready to help. Great breakfast. Highly recommend this hotel and will stay there again for sure! Rooms are nothing special, windows can't be opened, furniture weared out. Breakfast is very poor for this hotel class. I think this is one of the hotels where you can expect the unexpected... The best part is personnel, always smiling and ready to help. Need renovation for sure. I stayed many BW hotels but never like this. All the staff have goodwill but not capable to manage. Left my shirt for laundry but was received back with irremovable spots and totally ruined. And didn't even try to fix. Complimentary water and hot drinks were not refreshed for 3 days only couple of hours before we left. Rooms need to be renovated, especially carpets. Receptionist Lyubomir and waiter Petar were great and very helpful. I had a great stay at best Western hotel Expo. Friendly staff excellent service and great location. I will stay again there if I have a trip to Sofia. Metro station is just a hundred meters from the hotel. "Best Western should be better"
Heating system not working at all, just noisy. They gave me a noisy portable heater for the night. Ventilation system on the roof and water pooring in the walls can be heard. Matresses are curved and uncomfortable. Please see the pic of the heater that a 4 star hotel gives for the 1st night. Absolutly unbelievable! Very good accommodation. Everything clean a well prepared. Only problem in the night from Saturday to Sunday because of party in the next building. Drums all the night. Bonus early fly breakfast from 4 a.m.
"Decent hotel for a business stay"
Stayed put here and attended office across the road. What better can happen to a lazy guy? Breakfast was decent and so was the choice of meal and dessert for dinner. They also obliged us with early mini breakfast and free airport drop. "Decent Hotel for Expo Area"
"Tired, boring. Room smells of stale smoke." 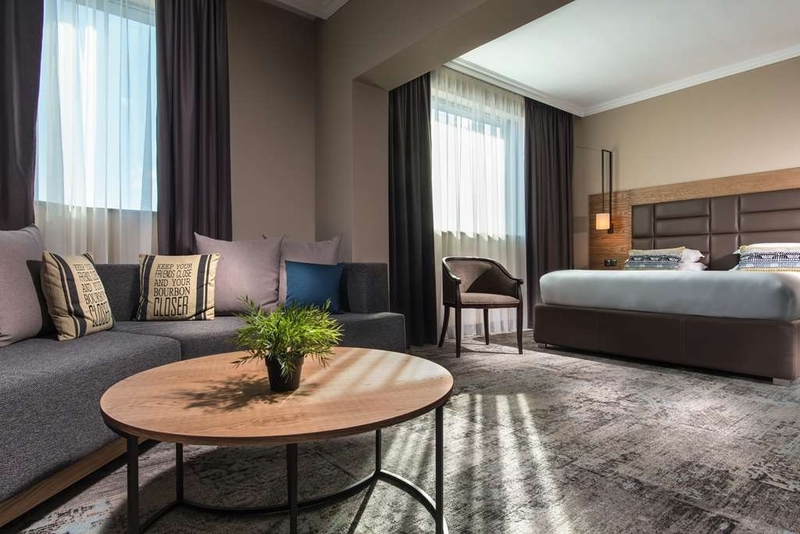 Apart from the fact there is nothing around this hotel except the expo centre itself, my rating is also based on the overall upkeep of the hotel. I wouldn't give it 4*. Negatives: On a motorway with nothing around. Restaurant has a poor menu. Bar is not even open. Room smelled very badly of stale smoke, as did bath robe which should have smelt clean. Mould on the ceiling above shower. Poor wifi connection. I did get a free upgrade upon checking in... So I wonder what the standard rooms are like!! :( :( Positives: Good selection of breakfast, friendly staff, handy for the expo. Good Hotel with good service. Stuff is nice and hotel is close to underground - 100 m. Breakfast is good, but cold drink wasn't good. Problems: You can't open a window. It's to hot in room. Water in a toilet falling like an hour after every usage. Came here as had some events in Capital Ford (just on the opposite side of street) and I found hotel quite reasonable - staff was polite and helpful, breakfast was good, the room was spacious enough and clean (maybe just lacked some more lights for my preference). The hotel is a bit on the edge of the area, there is nothing really to see around. But just a hundred meters away is a metro stop which connects you to all the city, by taxi - it's like 7-8euros till city center. My stay here was good! I when to the hotel for a event and I was surprise how easy was to get to the place. Only 4 stations. Good size rooms and clean. the elevator is small for a wheel chair but it is fine. If you have young children be sure they go to bed early, the TV have some open channels late night you want to see with your partner only. The service was good but the food is not all perfect. The hotel has free shuttle to the airport but on limited number and time. I would not visit this hotel again, ?he staff is always angry, from the reception to the maid, not to mention the waiters. They speak poorly in foreign languages ? ?or just do not understand. Nobody is interested in cooperating. I needed a headache pill, but nobody answered to my need. They could not even tell me where to buy. Hotel staff speak excellent English. Nice big rooms. The hotel is not really close to anything so you need to use the dodgy taxis ! Perfect for a couple of nights :) Close to the airport yet no food outlets / restaurants close by. "A wonderful relaxing place to be"
We enjoyed the outside garden where we were able to relax after a busy day. It was very hot in July. The wall sockets and fast internet facilities outside enabled us to do a lot of office work. It was the only hotel we stayed in during our 14 day trip through Europe which offered these facilities. Five stars for that alone! Reception desk staff were very friendly and helpful. The hotel was busy and the staff tried their best to be of service to everyone. Everything was super clean. We did not have great linen on the bed. A single bed-duvet for a double bed and only one cushion each. Apparently we could have asked for other bedding. But why not the correct bedding from the start? Otherwise this hotel can be recommended. The best smokers facility in any hotel outside too. All people were treated with respect. It is just ok place to stay one night. 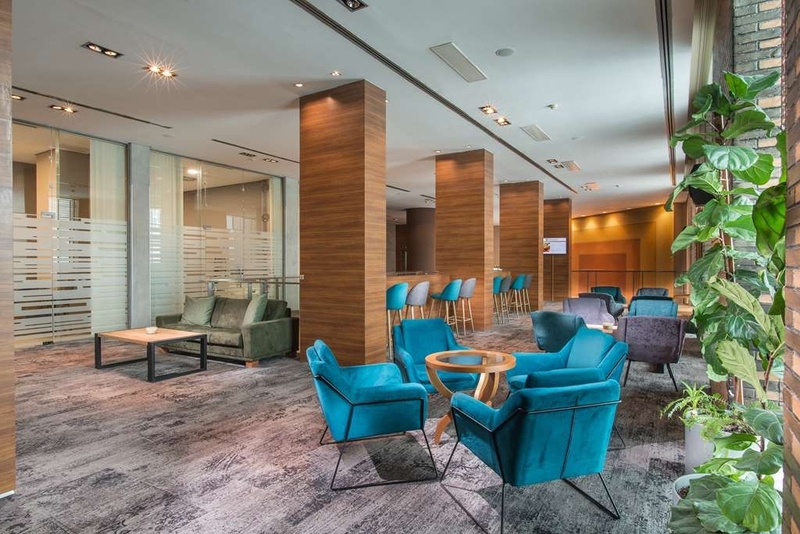 Lobby is not designed for business conversation, bar is not open 24h. Restaurant was good. Rooms were ok however bathroom could be cleaned better and we were missing couple of personal stuff in bathroom - we had our own luckly. Price/quality/location comparison - it is ok, but do not expect too much. "Horrible heat and management not in hurry to do something "
When the heat rises to 30-35 degrees during the day and air conditioning is working just as fun management took it's time. Following the repeating complaints they told it will take them few days to repair the system. 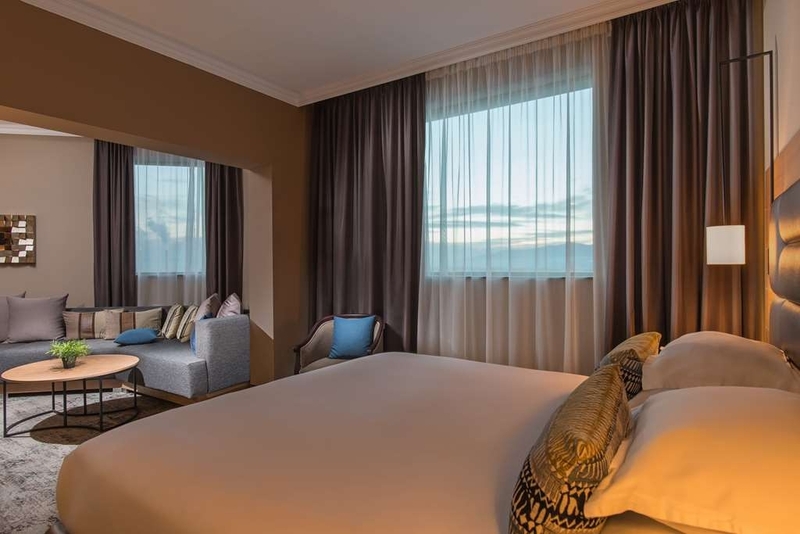 In addition there is no possibility to open any windows in the rooms, what made the room during the day feel like a heated oven (and during the night an over heated a bit less). The staff did their best to communicate it nicely to the guest, but it is not in their power to fix the air conditioner and the management probably doesn't care. "Great Hotel and Front Desk Staff - Lousy Restaurant Staff!" I overnighted in Sofia one day earlier this week. The rooms are great - immaculate, well appointed, good WIFI, nice views, comfortable beds, etc. The front desk personnel who were there when I (and several college students) checked in and out were GREAT - Nikolai Nikolaev and Aneliya. I mostly dealt with Nikolai during check-in, as well as the next morning when I was getting maps and information for walking around Sofia. He was SO helpful, kind, and respectful. Aneliya was the same way - especially the next day when I discovered I no longer had my adapter plug for European outlets. Nikolai lent me one of theirs so that I could charge my phone while waiting for the taxi, and Aneliya had the housekeeping staff check my room for the very small adapter - they found it!! The rooms are WONDERFUL and Nikolai and Aneliya made my stay near perfect. The restaurant staff, however, on the night that I dined there with three colleagues (Monday, June 19), was NOT great. *Peter* and *Tsvetan* were rude, disrespectful, and unprofessional; they assumed stereotypes of Americans and overtly treated us as that stereotype (even though we'd been working in Bulgaria for almost four weeks, and I had picked up a fair amount of the language), and they behaved like rude, petulant children when we were settling the bill. I have never been treated so rudely and unprofessionally by restaurant staff. I understand that separating checks isn't a standard thing in Europe (although MANY places will do so without any annoyance or eye roll), but when a dinner bill is brought for four people, and we're all staying in different rooms, and all were planning on paying by different methods, they shouldn't have been surprised we asked for individual bills. I tried to explain that we were all in different rooms and that some of us had cash and others didn't, etc. We very kindly and respectfully asked if we could get separate checks and if a bottle of wine could be split among two of them - before the wine question was even out of my mouth, I was interrupted, and told "No, we do NOT split items!" It went on from there - with one of them pounding on the computer touch screen, muttering under their breath in Bulgarian, implying that they could tell we were Americans by the way we were acting, etc. I filled out my hotel comments card accordingly - giving high marks for the hotel rooms, front desk staff, food, etc., but letting them know in no uncertain terms that the restaurant staff that evening was some of the worst I have ever experienced - in American and abroad. "It was hotter than hell!!" When we arrived at our room the outside temperature was 30+ C, the room was hotter. The front desk said to turn on the AC and wait for it to kick in. Well we left the room with the AC on & came back 5 hours later, the room was the same temperature. We laid in the room for 1 hour and couldn't take it anymore. We left and checked into another hotel. The front desk at least paid for our taxi to the other hotel. "Conveniently located but nothing special"
The hotel obviously caters for people on business and those simply passing through Sofia. 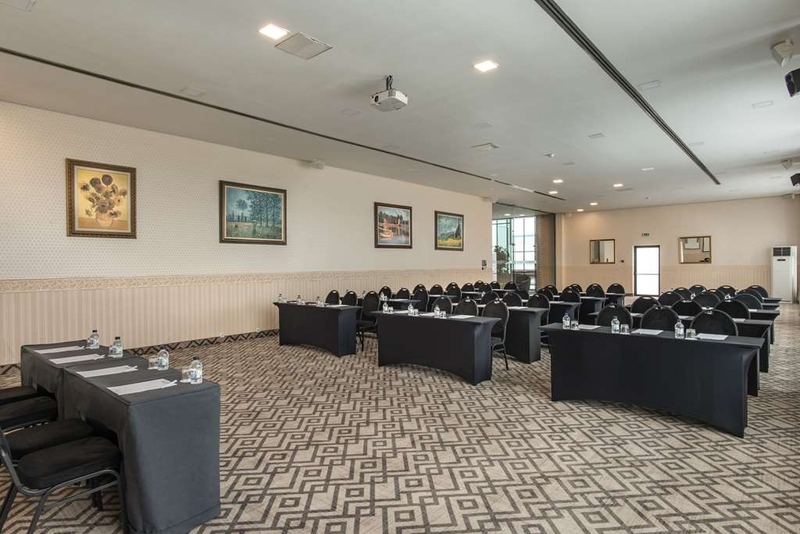 It is conveniently located close to the airport and has good facilities for conducting a training workshop as we did. My room on the 9th floor was quiet (except for the very loud ventilator of sorts which remained on for a few hours and then turned off) and relatively clean, and the staff were ok. The breakfast was not particularly inspiring as it remained the same each day with little variety. I would not recommend the hotel for comfort but it served its purpose as far as business was concerned. the do-called fitness centre was totally inadequate. Just returned from a over nighter, stayed several times and must say prefer this BW to others in the area. Staff always polite and rooms for price pretty good, but would say carpets need a deep clean as getting rather soiled. All in all good value with good location and Free parking which is an added bonus. 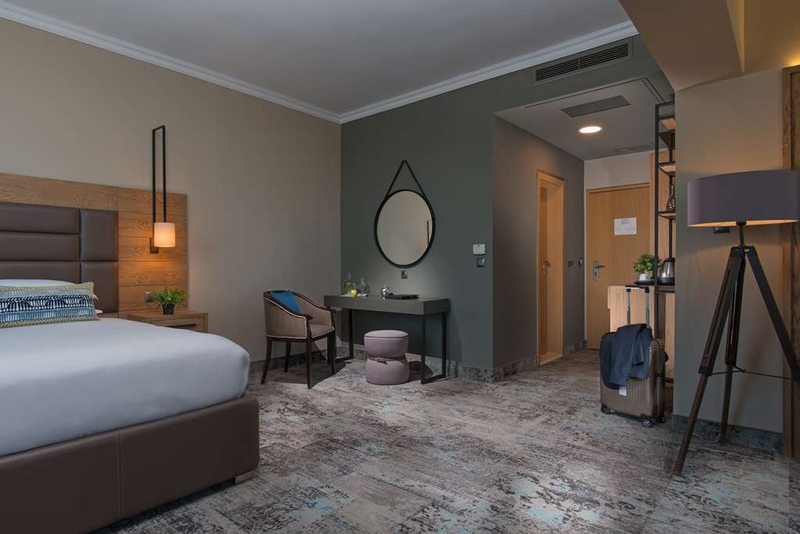 "Clean, easy and a good breakfast"
Simple check in, clean room that was very spacious and for our needs the location was spot on. 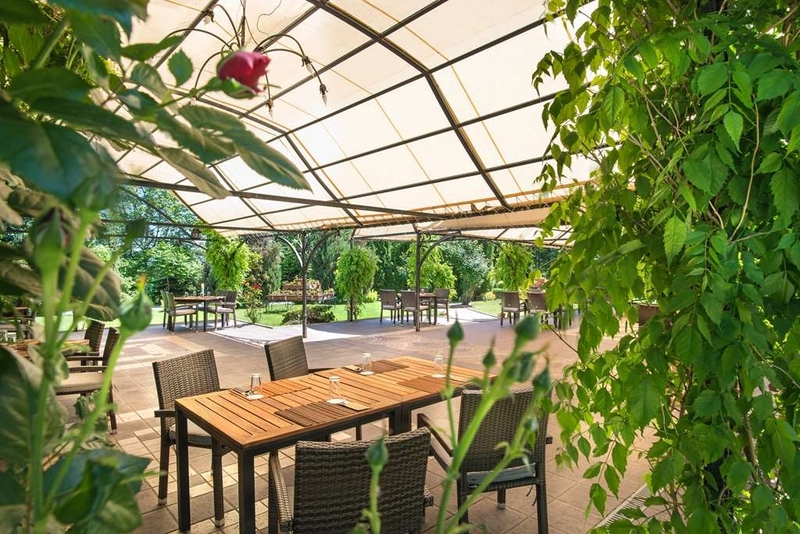 The hotel is laid out well and with free parking is a great place to explore Sofia and Vitosha.. This is our second stay and no doubt will use again. 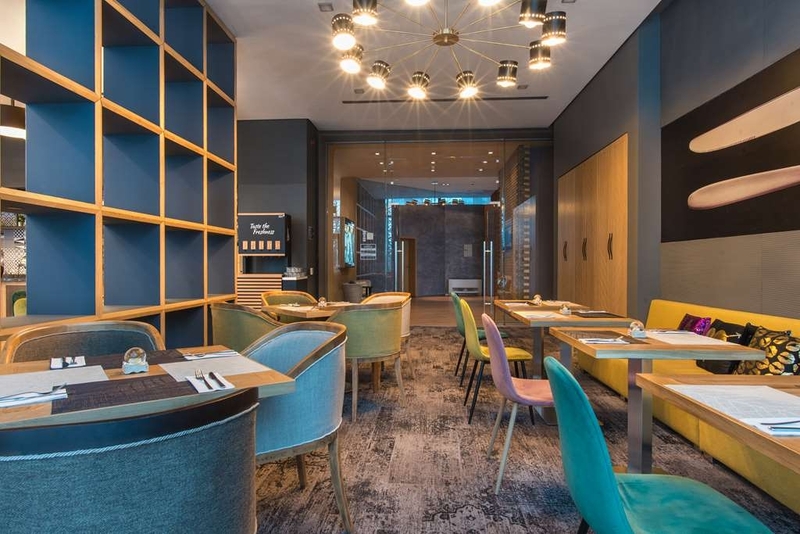 "Unfriendly staff , stinky room , liar concierge "
I visited this hotel some days ago when in Sofia for business and my experience was disappointing. All the staff was totally unfriendly and cold , from the personnel in the reception until the waiters in the breakfast. Even the cleaning lady was angry on us probably because she wanted us to leave earlier the room. We asked for an early check in and although one person in reception told us that they can prepare a room soon ,then a lady came and she announce that the check ins are in 14:00 so we have to wait . After a quick debate we left and we came again after 90 minutes where they told us that they will give us a room. When we enter the room disaster . It was smelling -stinking- actually cigarette . It was the worst feeling I ever had entering in a hotel room . Last but not least , when we were going out and I asked an umbrella from the concierge and he told me that he hasn't any . Big lie in a hotel of 150€/night for a simple room. I would never return again in this hotel as there are a lot hotels with better service and better location in this price in Sofia. Next time I will stay In the CENTRE as is more convenience to move around . We didn't stay for long. The room was big and clean and the bed was comfortable. It is located near the metro so it is easy to get there and easy to travel to the city. We had to leave very early in the morning at about 03:30 and they made a buffet for the people who left early. "Good hotel but requires experienced receptionist"
The hotel is a nice one and clean. However, I have two unpleasant experiences with the receptionist. First of all, we had already booked a seminar room for 20 people to begin at 9.00am. Indeed, the room should have been opened before that time in order the attendees could entre and sit. For that reason, I visited the room at 8.50am and noticed that it was closed. I then informed the receiptionist but after another reminded at 9.00, he then arranged with his colleague to open the room 7 past 9. They should know that seminar rooms should be opened before the session formally begins. Another unpleasant experience was with the same receptionist the day after. I informed him that my flight is at 14.10 and he told me that the shutle will be arranged for 12.15. However, the shuttle didn't come till 12.40 where for the second time I talked to him that I would make a formal complaint for ignoring the necassary arrangement which was required. He then left his desk and took me to the airport. I could have missed my flight just simply due to him ignoring me as a guest. "Good but Needs improvement "
Location good - next to exhibition centre, not far from airport and on the Metro line. Room was very hot and temperature could not be controlled. On this particular occasion, the bed was really not comfortable. Light on desk not working. Good breakfast. Have used this hotel before and there was no problem so perhaps because it was very busy these problems happened. Rooms are big and clean. 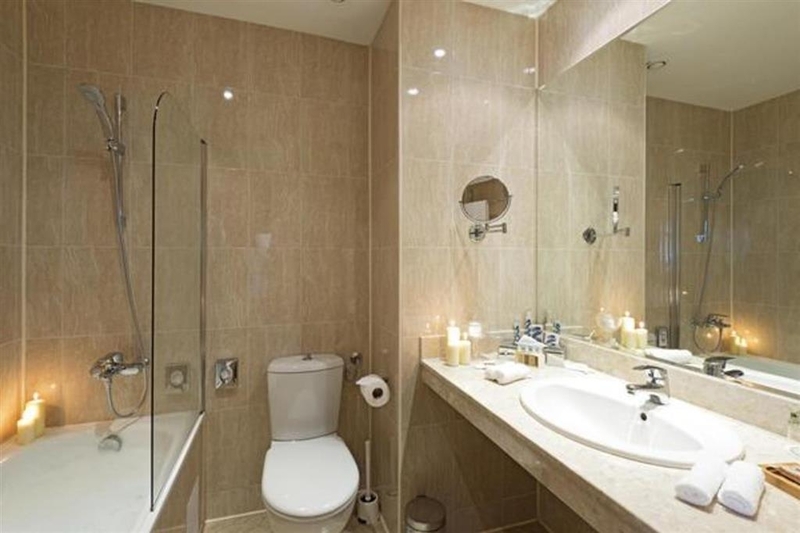 Bathroom, as well. Not possible to open window, but AC is working fine. Breakfast also OK. 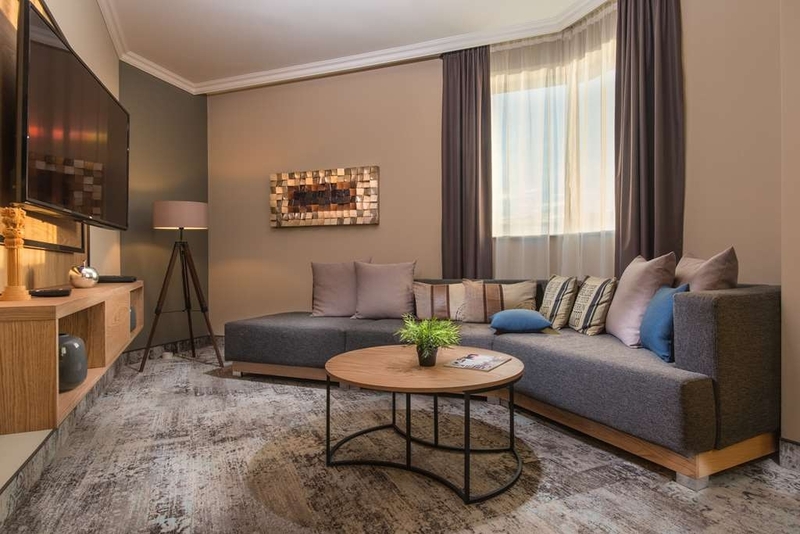 Location is in walking distance to Expo (200m) and good connection to airport (not passing through city center) Parking is OK. Internet connection is bad, very slow or doesn't work. TV in the room is too small, but picture is clean . Affordable price. the hotel is very clean, near to the city center, subway station. the most important thing for us was that they are pet friendly and the rooms are well phonic isolated. 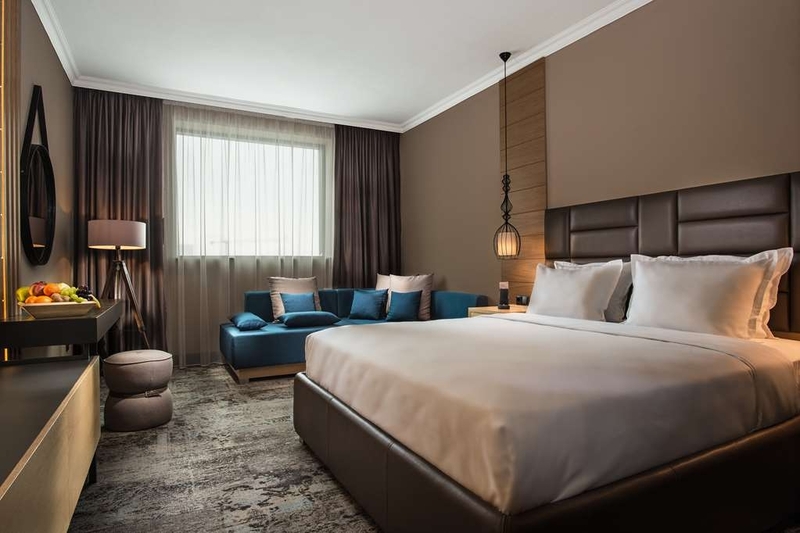 the rooms are well equipped, the furniture is a little bit old but nothing disturbing; the bathrooms are much cleaner than some other 5 stars hotels; cons: you should do something with the removable beds and may be change them - the bed where my son slept wasn't in best condition. the breakfast was plenty and very good! "Lovely staff but not the greatest location for siteseeing"
Stayed here for 3 nights for a wedding. It's located next door to the Expo centre so very business area and not where I would have chosen to stay as a tourist but we had a special group rate due to wedding. It's a 5 minute walk from metro - we used it to get to hotel from airport and it took about 15 mins. We had booked a twin room but we're placed in a tripple room and it was nice to have the extra room. Spacious and clean although a slightly strange smell in the bathroom; like maybe the toilet brush (hate those things) needed to be disinfected. The shower gel smelt lovely although it barely foamed. There was no lotion but I rang down and requested some and housecleaning brought some up. The beds seemed really low but once I was lying down it was comfy. There was no clock so had to use my phone for time in the morning and there was only one extra plug point so when we both needed to charge something we either had to unplug TV or fridge. Though I wouldnt quite rate it as excellent, there are some really great things about this hotel. The WiFi was probably the best I've ever enjoyed. Very fast and accessible all over the hotel. The staff were very friendly and accommodating. On the night of the wedding out waiter, Michil was phonenomial. Nothing was too much trouble. He explained the dishes we were unsure of, made sure our drinks were always topped up, and answered any queries we had. He was polite and always smiled friendly as he approached our table. Breakfast was a bit dull in my opinion and I just picked at a few things but on my last day I asked them if they could warm me one of the cold pancakes from the buffet which they did and I also asked for an onion and pepper omelette; they obliged and it was lovely so I left breakfast full that day and was kicking myself for not asking sooner. The hot drink machine dispensed a lovely guy chocolate. The lift, if not in use waits on the ground floor which can be handy. However at just times it can take ages to come. I was on the 8th door near to the stairs and found it quicker to walk on a few occassions. Any other brilliant thing about this hotel is that the sauna and gym are 24 hrs. The gym is small and I didn't see anyone else in it but there's enough there to get a good work out. 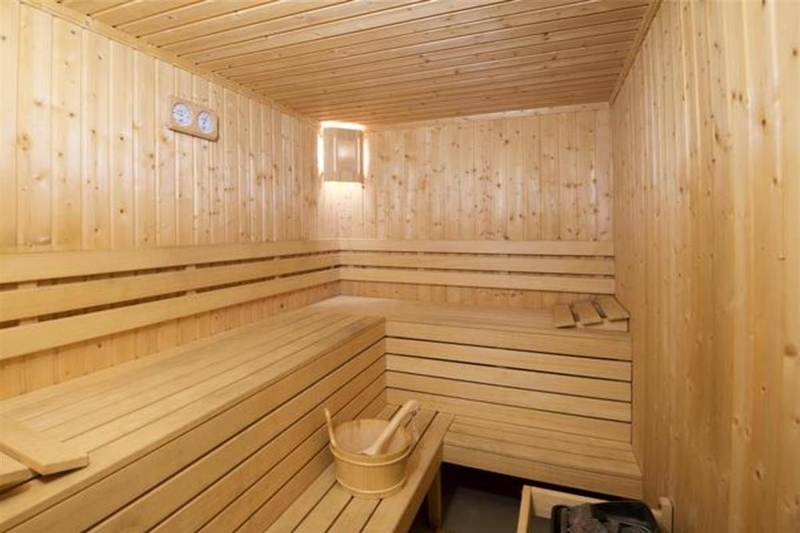 You have to give them 1 hrs notice to switch on sauna and allow it to heat up so you can't just head down on spur of the moment but great that you can acess anytime. We used it at 11.30pm after arriving back from finer at 10.30 and requesting it be switched on. There's a shopping mall about 20 mins walk away from good array of shops, food court etc. There's also an outlet opposite the hotel but because of road layout you have to walk to under path so its not as easy to get to as it looks and not as many shops as the mall and very limited food choice. There's a couple of canteen style eateries next door to hotel. Didn't try the food (seems like a lot of their business is from people at the exhibitions) but be warned - they close early, around 5pm. Nice hotel all in all. Not the best location for siteseeing etc. but 15-20 mins on metro and you're in town centre. Day pass costs 4 leva and 1.60 for single journey. Taxi from restaurant in town cost 12 Leva and about 10 into town - funny one way system means they have to go a long was round on way back. Used the hotel shuttle bus to get back to the airport but it cost €9.50 so a taxi would have been cheaper. The shuttle bus is free from 5am til around 10am. AC does not work at all even though they say it does. The fan provided for us was broken, which we found out when going to bed, so it was too late to report. When using the water in shower and sink it was full of sticky black particles, which ruined my electric head toothbrush, not to mention them sticking to my body. "Nice and quiet summer garden "
"Good Hotel, good for business, pretty quiet. Complete high end breakfast." Room 311, corner room, view was ok. The mountain view rooms are the best. The hotel is right by the subway which can get you around very efficiently. Go down to Serdika and see the Roman road exhibit that has just opened up. The rode was discovered as the subway expansion dig unearthed it. "Very good hotel very nice staff"
My lovely wife and I decided to have our wedding at Best Western Expo on June 12th. We met with the wedding organizer and she was very pleasant and helped us out a lot. With the great meeting we believed the hotel would be a great place for our wedding/reception. We even came and tried the meals that would be given to our guests, the food was excellent. Though I guess it was too good to be true. The organization of the waiters and waitresses was not great, additionally the food was not as good as when we had tried it the first time and some of our requests were not made correctly. We paid additional money to have unlimited drinks but the hotel ran out of many common drinks like diet soda, and coca cola. Additionally, we were told my family from America would be allowed to check out as late as they would like because they are part of the wedding party. When the day came to check out they were being called and told to leave because they were past their checkout time (we left the hotel rooms together around 1 (late night)). The Suite for my wife and I wasn't really that great, clean but it was just a bigger room nothing special for our first night together as a couple. Lastly, and most disappointing they "lost" our cake topper. For two weeks we emailed them and had several friends inquire about the topper, not until the maid of honor made a complaint to the PR did they all a sudden find the cake topper (we have suspicion that someone stole it). My Wife emailed them multiple times even the wedding organizer and never got a response thats why we felt we should write this review. Additionally, for other hotels in Bulgaria it was quite expensive and not that impressive and the wifi was poor. "No internet in the rooms"
Due to cancelled flight with Alitalia ended up here. Poor service, zero response to the complains. I can't believe there is a hotel with no internet room access these days. I wouldn't recommend to anyone. Bad location as well, even if you're looking for hotel near the airport. This hotel is right by a metro station which is only a few stops to the airport, so we picked it based on its location. We were pleasantly surprised that they also have a free shuttle to the airport, though it only runs a few times a day gratis. We were warned at check-in that the wifi was not working, but it did work for us, though it was very slow. The hotel was dated but fine for our purposes. We wouldn't hesitate to stay again if we needed an option which was convenient to the airport. Decent hotel for business traveler. Wifi was a little spotty, but overall good. Room was clean, and the Business Center had free drinks (bottled water, pop, some wine, etc). Breakfast was mediocre. Decent selection of food, but it wasn't kept very warm. Bed was OK. Nothing special. Outlets for Charging Laptops and such were not well positioned for being an "Executive Room". Airport shuttle started at 5:00AM and was ready on the dot. Nice Staff.. Good View through the room . Nice looking rooms with some disappointments, They Say Free WiFi but does not work always. House Keeping of the Rooms needs to be improved lot Even though House Keeping is done daily its not Up to the mark. Each day they miss cleaning some thing intentionally or unintentionally. Poor Room lighting.. I think you can make better deals for the same price in Sofia. but However it depends on your purpose of travel and location of visit Overall average deal for me since my office was next to the Hotel it was convenient to stay over there. 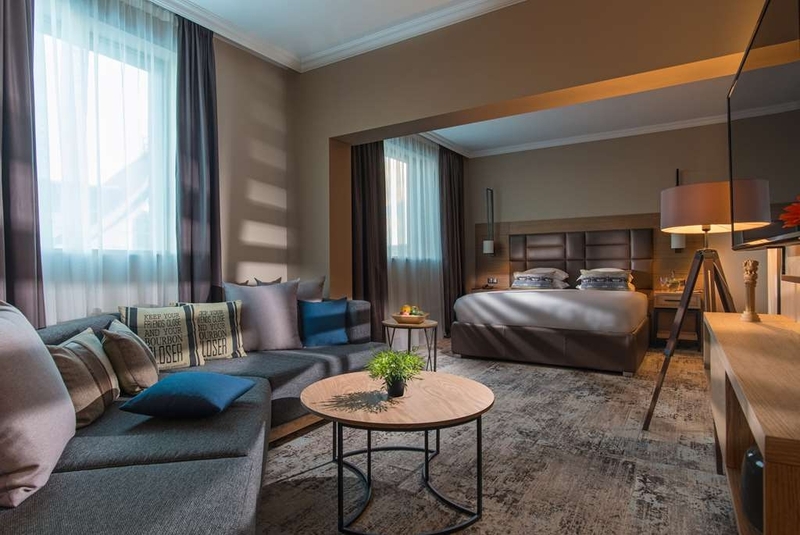 Staying in this hotel (Best Western EXPO Hotel Sofia) is a life time experience. I have stayed in more than 500 different hotels all over the world the last 30 years. This 4 star hotel is by far the WORST hotel I ever stayed. First time I stayed in this hotel was 2 months ago i.e. early April 2016. Dirty room, extremely low lighting (depressing), dirty curtains and carpet, no internet for 3 days, same towels for 5 days, 2 hangers in the cupboard (none for trousers) etc Unfortunately my company booked me again for 8 nights in this hotel starting 8th June 2016 i.e. I am already here for the last 3 nights. STILL 2 months after my first SHOCK ever, there is…….. NO INTERNET again (at the reception they keep telling lies that the problem just happened and they are fixing it). Only one receptionist admits that NO INTERNET is an ongoing problem that they try to solve!!! I had to change 3 rooms, dirty carpets, no air conditioning, bathroom fan very noisy (could not sleep), blocked drains, telephone does not operate (they told me to wait until next Monday to fix it) i.e. in 3 days, lighting of the room is unbelievably depressing, etc I STRONGLY recommend to AVOID this hotel under any cost. The hotel is clean, the service is good. You might find small details that could be improved, but not for this price. 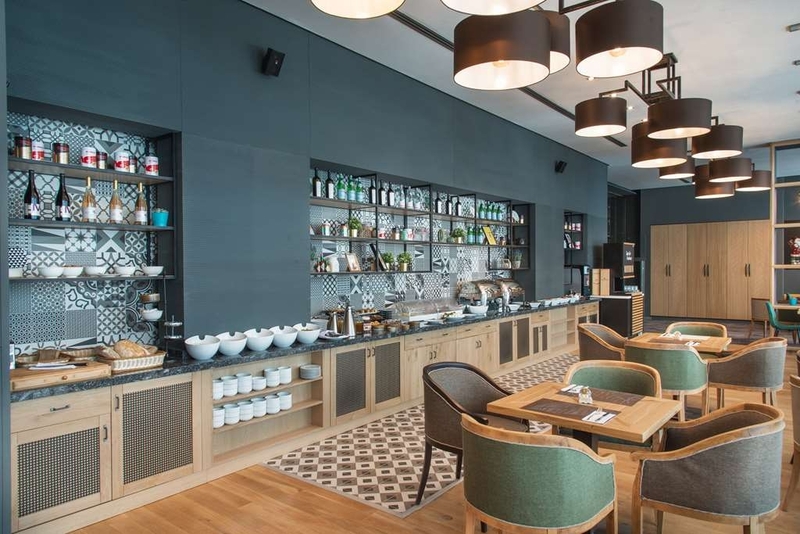 This is probably one of the most affordable 4-star hotels in Europe (except for exhibition times). With the underground station in walking distance you have excellent connections to the city centre and the airport. If you have too much luggage for public transport the hotels offers a free shuttle service to the airport. Despite being located directly at the highway the rooms are quiet - modern windows insolate quite good from the noise. 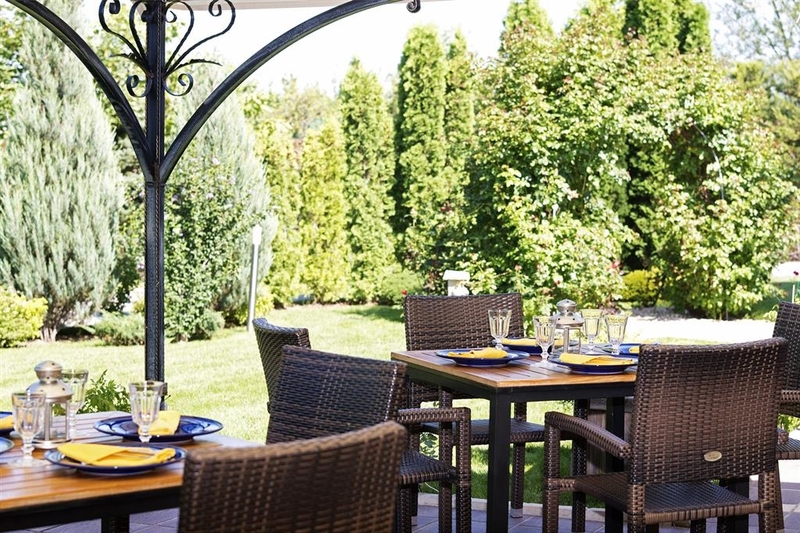 The breakfast area is very nice, especially during the warm season of the year, when you can sit outside. The selection at the breakfast buffet is big and the quality is really good. 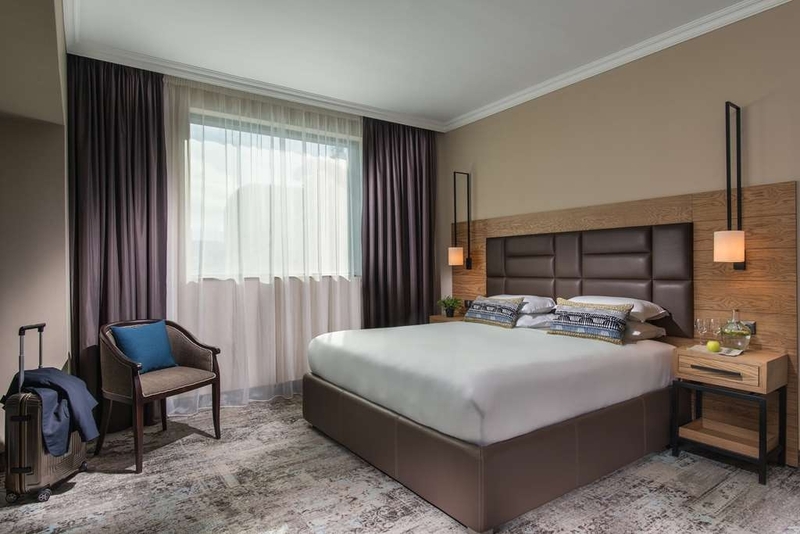 "No remarks for the 1 night stay"
A good hotel located close to the airport in Sofia, great English speaking personnel, good food in the restaurant, big room with mini-bar and cosmetics set. Internet connection should be improved. Nice view from the windows. The concierge was extremely attentive and friendly. Parking was good, even with an expo on next door. Room was ok, not the best in the group. Pubic hair on one of the towels. Drinks and food ridiculously overpriced, but no problen to have outside takeaway delivered to the room.breakfast was amazing, huge choice, with usual cup of bulgarian muddy adrenalin coffee, but super expensive if you wanted anything different, eg cappachino 14 leva if i remember correctly, usually 3 leva on the high street. Wifi not great. Glass lift on outside of building which was cool. Staff are great and really work hard. 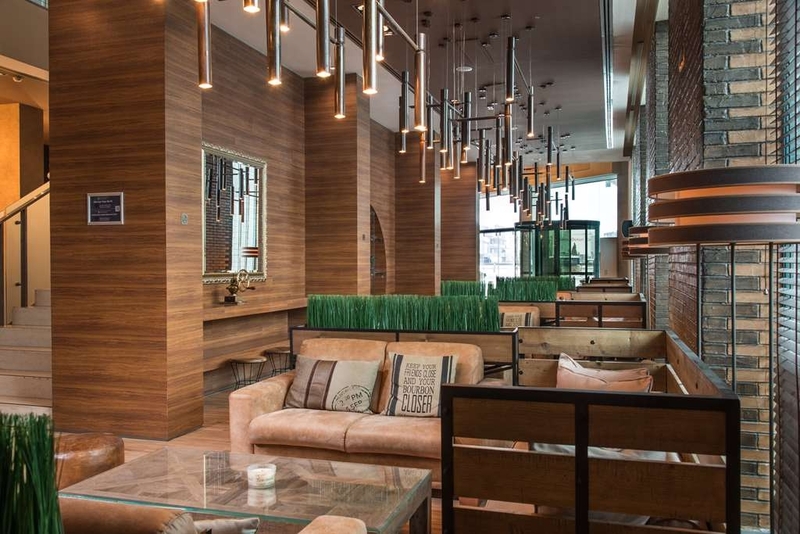 Decor is very tired; bar closes at ludicrously early time; rooms are very hot and thermostat does not appear to be connected to anything; plumbing is from another age with shower water temp controlled by toilet usage an ajacent floors. It is however good value for money if you don't have high expectations. It was nice to spend night in this hotel. It is nice hotel located close to the street but room was quiet. Hotel looks good, rooms clean and tidy. In my room free of charge tea and coffe were available. I was also given some fruits what was really nice. Stuff professional and helpful. Breakfast was good. Recommend spending some time there. "Great friendly staff with poor room product." Friendly staff at the front desk, answered every question possible related to the surrounding and city. Very friendly and nice concierge named Spas, offered and helped us to exchange currency (good rate), recommended us a very nice Bulgarian cuisine restaurant and briefly explain us the city along the way to the city. However, room is poorly equipped and noisy. Room with no tissue, had to use the toilet roll, the socket are loose, no pen no pencil, teabag opened, room too dim, wardrobe too dark, a very small/single duvet on the centre of 2 single beds (weird) and the remote control not functioning well. Called to the reception and they quickly replace with another one. The people there are all great, done a very good job, but the hotel room products not on par. My family stayed in two rooms, one on the second floor and one on the fourth. The people staying on the second floor heard noise until very late at night that kept them from sleeping. There was music being played at a party on the first floor and it could be heard throughout the hotel. This was awful because we had an early flight and basically got no sleep. Those staying on the fourth floor suffered from excessive heat, even with the air conditioner turned down to its lowest setting. Finally, all of the hotel extras, such as food, were overly expensive for Sofia. The only upside is that it is close to the airport and that the staff are professional. It was the 1st time we have been to Sofia in Bulgaria. We used Best Western Hotel Expo for our stop over hotel. We stayed on 26th Oct 2015 and 31st Oct 2015. It`s only 10 minutes form Airport and City center. Hotel free airport shuttle service was excellent, it was on time to pick up at airport. We had the deluxe family room on top floor with great view. The late evening meal and morning breakfast was good. The hotel staff's are very friendly. Hotel is value for money. We would definitely stay again. Absolutely Perfect! Close to the Airport! 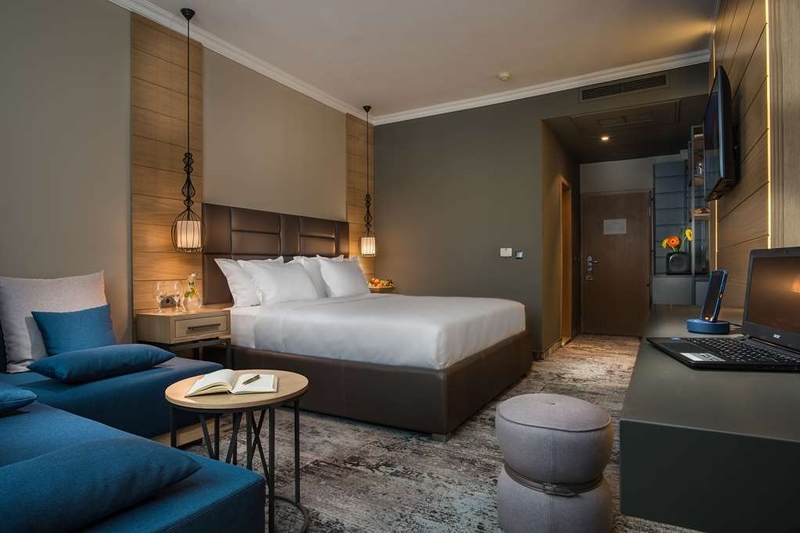 comfortable rooms! Nice breakfast! Free parking! The stuff is so reliable! If you have any questions they are answering and explaining all you need! 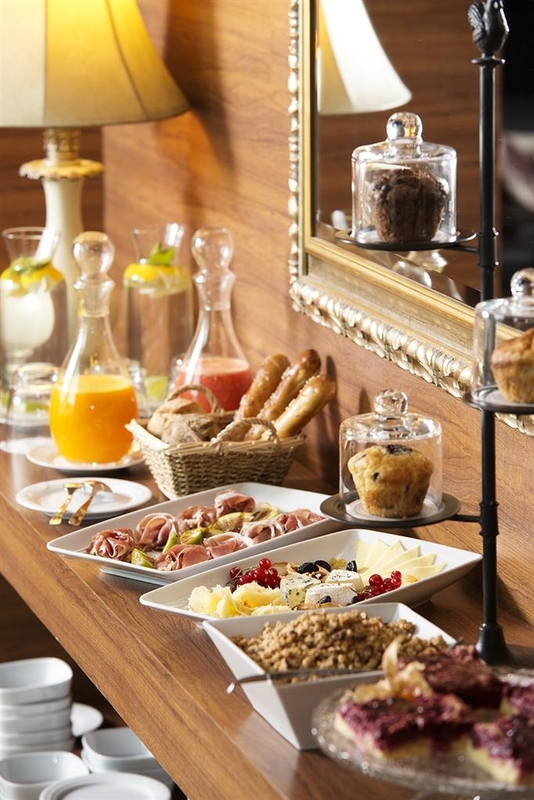 If you do not want to pay the breakfast in advance, you have an option to go in the morning, to see the food, and if you like it to eat, and pay after! And the are offering free shuttle bus to the Airport! "Fine for anyone who prefers to sleep in an airless oven"
This is a perfectly pleasant modern hotel with friendly staff on the outskirts of Sofia, conveniently close to the airport. However... The rooms have windows that cannot be opened and aircon which, it transpires can only be used to heat an already warm, airless room. (When I questioned this, I was told that, despite the presence of a 'cool' button, it takes 24 hours to reset the system to allow it to do so.) In other words, I was told, the only way to reduce the temperature is to turn off the heating. 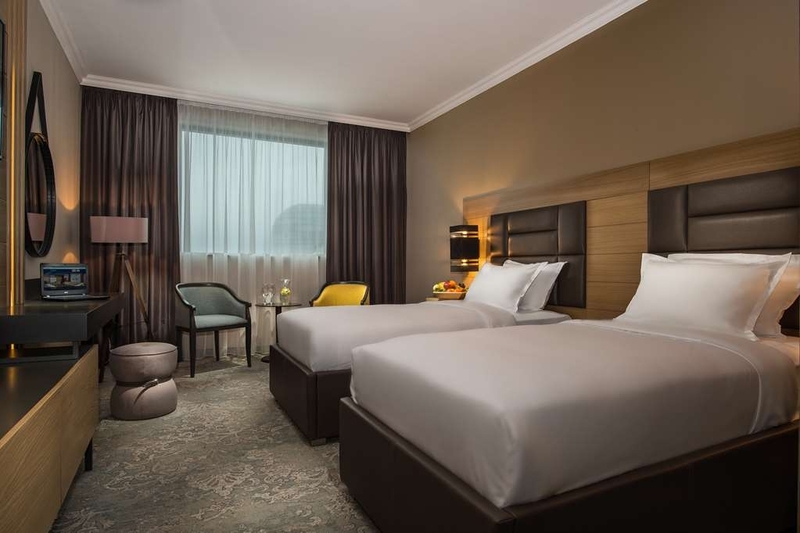 "Nice and close to the airport"
It's half way between the airport and the city, it takes around 15 min to get to Sofia downtown by taxi which should be around 10 lev ( 5 EUR ) The room service is quite fast and I consider it to be a good quality, the staff is friendly and helpful. Hotel was very busy but all staff were attentive and helpful. Brief overnight as hotel is close to the airport. Room clean and comfortable but soundproofing could be better. Would stay again when taking early morning flight. "We had our wedding there - totally suggest it for such an event"
Choosing your location for the wedding isn't easy but once you meet the staff of the hotel, the final selection is done! The staff is professional, any time we would go and ask questions, check the venue, etc., every single staff member has been friendly and supportive. We've tried the restaurant a few times and everything has been great. The wedding went fantastic and smooth. After that we stayed at the hotel - it was comfortable and spacious apartment. Well, once again i have satyed in Sofia for a night. Arrived late after i had to call for the my transfer!! Arrived tired ...well beds are not soft at all!! wake up in the morning and i had back pain... Hair dryer not working due to a fault, cable was burned out but no one told anything!! Bed sheet had a hole !!! Housekeeping ??? hello !! Breakfast was ok but i prefer the old way serving the coffee and not from the machines- powder or frozen coffee.. nice that they had some fresh fruit to take!! convenience as it is close to the air port..
"Reasonable value for the money"
Had just a one night stay. Hotel was clean enough though the room was quite stuffy and had a dusty smell. Unable to open any windows to let any fresh air in. Transfer to the airport was quite expensive in relation to a taxi fare.